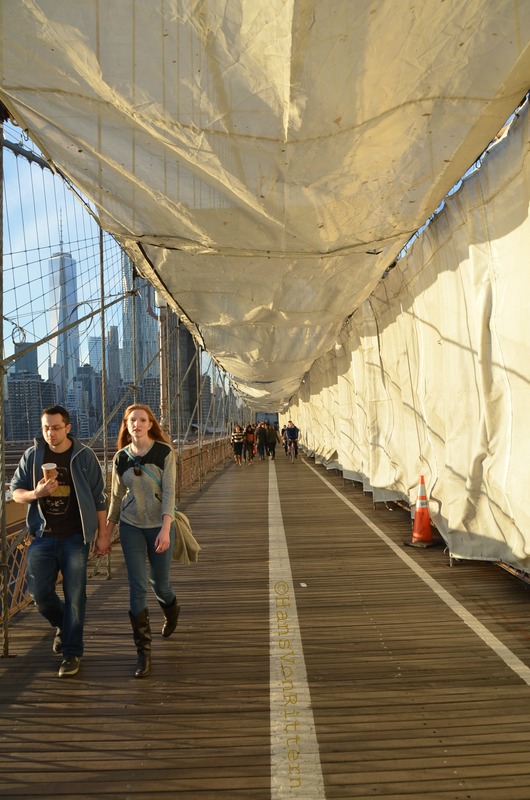 Photo of the day: COVERING BROOKLYN BRIDGE – Strolling the Brooklyn Bridge is always a breathtaking experience. The trick is to start in Brooklyn Heights and first take in the view from DUMBO and the Heights then cross the bridge as Manhattan looms larger and large in front of you. On a crisp blue spring day it is always thrilling to me. Don’t forget to look down so you can see the cars below and the barges passing in the river. Don’t forget to look straight ahead so you see the spider web design of the cables. Don’t forget to look up so you can take in the majestic gothic arches of each tower. Currently the bridge is going through it’s final stage of renovations following the total overhaul of 1983 for it’s 100 year anniversary. Heralded as the first large suspension bridge ever built by my people, the German Roebling family, at a little over a mile long it stands as one of New York’s and America’s true treasures. Come cross it with me sometime! This entry was posted on April 28, 2014 by newyorkcityinthewitofaneye. It was filed under DAILY PHOTOS WITH STORIES OF NEW YORK CITY and was tagged with 2013 2014 renovation of Brooklyn Bridge, architecture, Brooklyn, Brooklyn Bridge, Brooklyn Heights, Brooklyn waterfront, DUMBO, East river New York, first suspension bridge, German Roebling family buiilds Brooklyn Bridge, Hans Von Rittern, Manhattan, New York City, New York photo, Photo of the day, photography, views from Brooklyn Bridge, walking the Brooklyn Bridge.